This elegant Akribos XXIV watch features a sophisticated touch of diamonds on the dial. 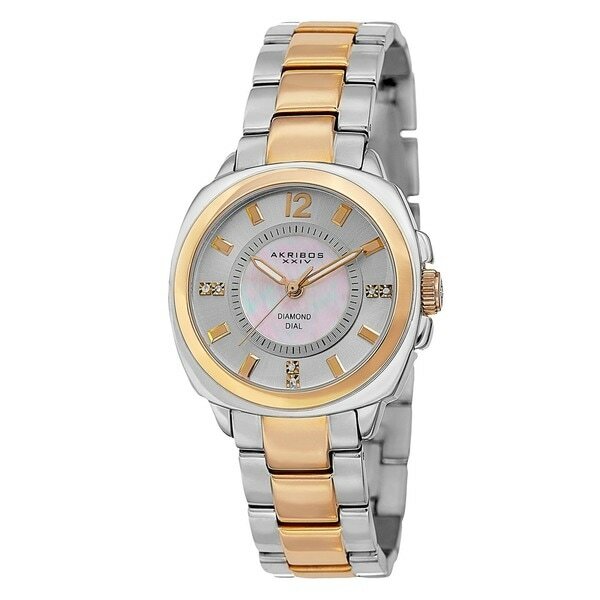 The Swiss quartz movement and stainless steel bracelet makes this a very reliable timepiece. The mother of pearl inner dial adds to this beautiful look. This is a beautiful, functional watch for everyday wear, as well as pairing with bracelets to dress it up. I really like the color and size of the face on it, the subtle glam of small diamonds on the neutral white face at 12/3/6/9:00 positions, but with gold notches at the other number positions, as well as the second hand. I did have to have a jeweler remove a few links in the band, which was an additional cost I would have liked to not have spent in addition. However, I decided the function, style, and neutrality of both gold and silver tones of the watch were worth the added expense, and the band is very comfortable to latch on/off, as well as during wear. A winner piece of jewelry, looks great with bracelets. It looks better than the picture! Nice, heavy, sturdy watch and attractive too! she liked them both very much and I returned the other two out of the four we received which was in the cart and I was going to pick one watch but found no way to delete the ones I did not want. The next thing I knew I bought 4 watches. Customer service said to receive them and send back the 3 we did not choose. I love this watch now. When I first got it; it would run for a few hours and then stop. After a few frustrating days, I took it to a local jeweler and he replaced the battery. RUNS SMOOTHLY NOW; I AM SO ENJOYING IT! Sad to say, after a couple of months of wearing the watch; it stopped running again - over and over, even with the new battery. Finally, I just gave up and tossed the watch in the trash can. Sad that a new watch with a new "replaced" battery WON'T WORK. "Does it light in the dark"
The hands glow in the dark.